Following our last week’s post titled “Boston’s take on poutine“, we got a few requests to explain what the “real thing” looks and tastes like and whether or not it can be part of a healthy diet. As you will learn by watching this video, poutine apparently originated in the late 1950s. Several communities in Quebec claim to be its birthplace. 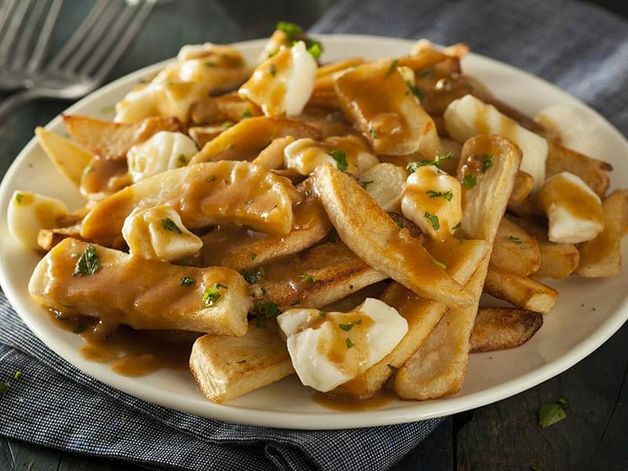 While the exact origin of the name “poutine” is uncertain, some people say it is simply a French transformation of the English word “pudding”. In the basic recipe, French fries are topped with fresh cheese curds, and covered with brown gravy or sauce. The French fries are of medium thickness, and fried so that the inside stays soft, while the outside is crunchy. The gravy used is generally a light chicken, veal or turkey gravy, mildly spiced. To maintain the texture of the fries, the cheese curd and gravy is added immediately prior to serving the dish.